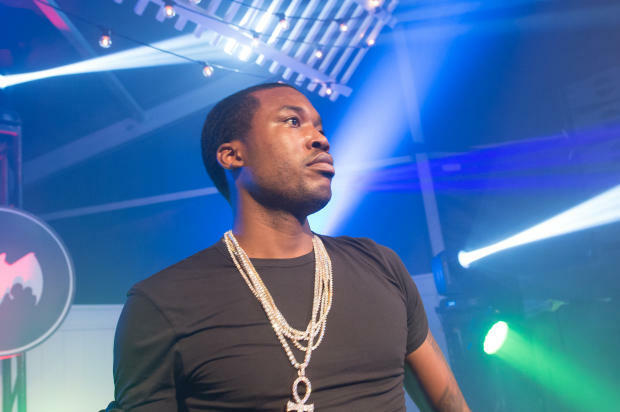 NEW YORK -- Rapper Meek Mill was arrested on reckless endangerment charges Thursday night in New York City after allegedly performing reckless stunts on a dirt bike, reports CBS New York. The rapper, whose real name is Robert Williams, reportedly posted video on Instagram showing himself and others popping wheelies on dirt bikes through a Manhattan neighborhood. DNAInfo reports Williams was allegedly riding without a helmet, taillights or license plates. The NYPD says the video shows the rapper popping wheelies "for extended periods of time" near other bikers, making right turns in a left-turn-only lane and changing lanes in front of oncoming traffic without signaling, according to DNAInfo. Investigators were tipped off to the video and later tracked the 30-year-old down and arrested him. The video has since been removed. The rapper's lawyer, Joe Tacopina, told CBS New York his client had been singled out because of his celebrity. "He's a rapper, he has a bad boy image, maybe his lyrics aren't popular with law enforcement or something. I don't know," Tacopina said. "But it's clearly a situation where they're targeting a young black entertainer." Sources told the station that felony charges against the rapper have been dropped, but he could still face misdemeanor charges. Williams was reportedly arraigned Friday afternoon and released. DNAInfo reports a judge ordered him to complete a driver improvement program by his next court date on Oct. 11.